As Plan Administrator, when a participant dies, you are responsible for checking the participant’s records to determine his or her named beneficiaries. The participant may have named both primary and contingent beneficiaries. You determine the beneficiary and what types of death benefits — if any — a named beneficiary may receive. After retirement benefits begin Continue to the named beneficiary, if any, provided the payment option elected by the participant allows for payments to continue to a beneficiary (such as the joint and survivor option). If the participant elected an annuity, the Program used the participant’s plan assets to buy an annuity from an insurance company. So, on the participant’s death, the insurance company — not the Program — needs to be notified by the beneficiary. Before retirement benefits begin Will be paid based on the terms of the plan in which the participant was enrolled (check your adoption agreement and Article 6 of the Plan Document). In addition, benefits will be paid according to whether the participant was single or married. Married at the time of death and if annuity payment options are not offered by the plan His or her spouse in a lump sum or another optional form of payment available under the plan and elected by the surviving spouse. However, with the spouse’s written and witnessed consent, the participant may have named a beneficiary other than his or her spouse. Married at the time of death and if annuity payment options are required by the plan His or her spouse in the form of a life annuity (unless the participant elected that 50%, rather than 100%, of his or her benefit be applied to provide his or her spouse with a benefit). 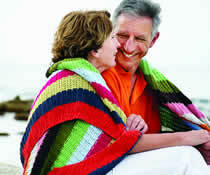 This annuity pays monthly benefits to the spouse for the rest of his or her life. If the spouse wants a different form of payment, he or she may waive the annuity and elect another option. Single at the time of death The named beneficiary in a lump sum. However, the beneficiary may elect to receive any form of payment the participant was eligible to receive before his or her death. Be sure to send a “Special Tax Notice Regarding Plan Payments,” “Notice of Benefits and Benefit Payment Form” and “Notice of Waiver and Election of Alternate Benefit Payment Form” to the beneficiary(ies) along with the Death Benefits Claim Form. 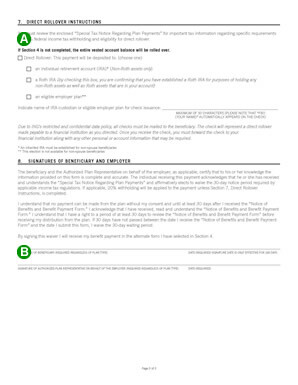 In order to process the death benefits, the Program will require an affidavit from the executor or administrator of the estate attesting to the name(s) of all next of kin and their relationship to the participant (including whether the participant had a child who predeceased him or her, and whether that deceased child had children and their names). Please also include documentation attesting to the appointed executor of the participant’s estate and a certified copy of the death certificate. If the beneficiary is a minor, the parent or guardian will need to provide a copy of the documentation attesting to the relationship of the minor to the deceased participant. When a participant dies, the timing of payment to his or her named beneficiary is subject to strict rules. If death occurs before payment begins, payment to a non-spouse beneficiary must begin before the end of the calendar year following the year the participant died and must be made over the beneficiary’s lifetime in an amount based on the beneficiary’s life expectancy unless the non-spouse beneficiary elects, by September 30 of the calendar year after the participant’s death, to receive all payments by the end of the fifth calendar year after the participant’s death. If death occurs before payment begins, payment to a sole beneficiary who is the participant’s surviving spouse must begin no later than the end of the calendar year that the participant would have turned age 701⁄2 if the participant had survived, or, if later, the end of the calendar year following the year during which the participant died, and must be made over the spouse’s lifetime in an amount based on the surviving spouse’s life expectancy unless the spouse elects to receive all payments by the end of the fifth calendar year after the participant’s death. Such election must be made by the earlier of September 30 of (1) the later of (a) the calendar year after the year of the participant’s death and (b) the calendar year in which the participant would have attained age 70½ and (2) the calendar year containing the fifth anniversary of the participant’s death. A non-spouse beneficiary may roll over the distribution only to an inherited IRA. Before a beneficiary may roll over the account, the required minimum distribution may have to be paid if the participant was over age 701⁄2. To request survivor benefits, the surviving spouse or beneficiary(ies) must each complete a Death Benefits Claim Form. To request a quote for annuity payments, the beneficiary must also complete an Annuity Quote/Purchase Form. 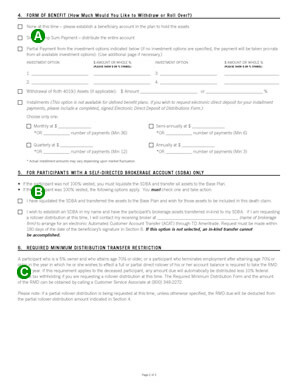 For direct deposits of installment payments to the beneficiary’s account at a bank or financial institution, the beneficiary must complete an Electronic Direct Deposit Form. When submitting the Death Benefits Claim Form to the Plan Administrator, the beneficiary must also include a certified copy of the participant’s death certificate (bearing a raised seal or ink stamp). A. You complete the employer information that relates to the plan. B. The beneficiary completes the deceased participant information. Each beneficiary completes a separate Form. • Attaches a certified copy of the participant’s official death certificate. • Includes any other required documentation (such as testamentary letters, affidavits, etc.). A. The beneficiary checks a form of benefit and completes the relevant information. B. The beneficiary should complete the Self-Directed Brokerage Account section if applicable. C. The beneficiary should read the Required Minimum Distribution section. A. The beneficiary completes the direct rollover instructions, if applicable. B.The beneficiary must sign and date the form. 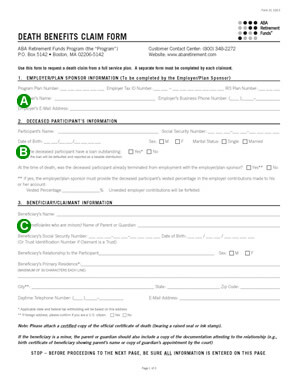 Then, the beneficiary sends the form to the authorized plan representative for signature. Once you receive the beneficiary’s completed Death Benefits Claim Form, you must review and sign it as the Authorized Plan Representative. Mail the completed Death Benefits Claim Form, certified copy of the death certificate, and, if applicable, affidavits and testamentary letters to the Program using one of the methods described under “Mail & Email” in the Forms, Tools and Resources section of the Guide. If the deceased participant’s account contained an SDBA, see “If participant has an SDBA” in the “Distributions” section. The Program will process the Death Benefits Claim Form upon receipt and send a check (if applicable) to the beneficiary. In January of the next calendar year, the Program will mail an IRS Form 1099-R to the beneficiary regarding any taxable distribution for the prior tax year.